. This website created as a level one final project for Sisters in Celebration. Cerridwen is a Celtic Welsh Goddess. Her name comes from “ceryd” which is Welsh for chiding love and “gwen” which is Welsh for white and blessed. 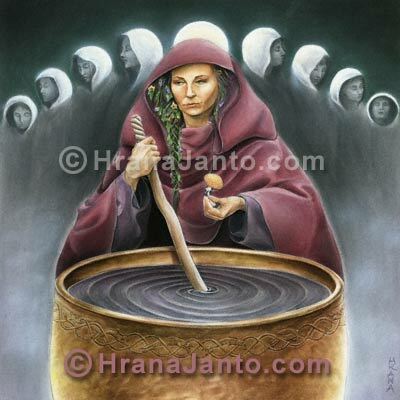 She is the Mother and a Crone aspect of the Triple Goddess and is often represented as an old hag or witch and called Hag of Creation and the Old One. Cerridwen is a shape shifting Goddess able to shape sift from an old hag to a beautiful girl and various animals. She is a corn goddess and is symbolized often as a sow as well, an animal of abundance and fertility, as the Goddess of Sovereignty. This totem animal also represents the fecundity or the Underworld and the strength of the mother. Cerridwen is one of the faces of the dark Goddess and a goddess of dark prophetic powers. Cerridwen’s cauldron is one of the many cauldrons of Celtic lore. The Cauldron in Celtic tradition was central to the religious mystery and represented the regeneration in the womb of the Goddess. Her cauldron was called Amen and was the Cauldron of Divine Knowledge, Wisdom, Rebirth, and Inspiration. It’s transforming magic happens through change, experience, and divine inspirations. Cerridwen lived in the middle of Bala Lake in North Wales underwater with her husband Tegid Foel and her two children. Her two children were born from the womb as twins, a daughter Creirwy and a son Afagddu. Creirwy was a very beautiful fair maiden and Afagddu was a very ugly dark boy. Together they represent the light and dark. Since her son was so ugly Cerridwen was concerned about him and wanted her son to be more accepted by his peers and society despite his ugliness so she planned to create a magic potion in her cauldron that would make him a brilliant, wise, inspiring man and a talented bard. The magic potion was to be stirred and boiled a year and a day as common in Celtic magic and to be condensed down to three powerful drops containing the wisdom of the world and the rest would be poison. Helping tend the cauldron of Cerridwen’s magical potion for her son was a young man named Gwion-Bach. He helped stir and keep watch over it. One day when Cerridwen went out to collect more herbs for the brew the potion bubbled up and splashed onto his hand by accident the three drops of wisdom and in pain and he instinctively put his fingers in his mouth. He instantly gained the wisdom and knowledge of the world and could understand all the secrets of the world past and future. This may be inspired by a Celtic divinatory practice of thumb chewing in early Ireland called Imbas Forosnai to gain wisdom and perception. Furious Gwion had licked the magical drops met for her son Afagddu, Cerridwen began to chase him in rage shape shifting into different animals. Gwion became a rabbit and she became a dog. He became a fish and jumped in the water and she became an otter. He became a bird and she became a big hawk, Finally he became a grain of corn and she became a hen and ate him. The grain of corn impregnated Cerridwen and she was pregnant for 9 month and 9 moons. She was so angry she plotted to kill the baby once she gave birth, but the reborn Gwion was too beautiful at birth to kill. Instead she sewed up the newborn in a seal skin bag and threw him into the ocean. The baby was rescued by Celtic Prince Elphin son of King Gwyddno Garanhir from the water. He was called Taliesin which means “behold radiant forehead”. He became the legendary and greatest Welsh bard and satirist in the land, a counselor of kings, and was perceived as the genuine incarnation of Druidism. The Welsh belief that for true inspiration to be brought to the world there must be death and rebirth is represented by this story. 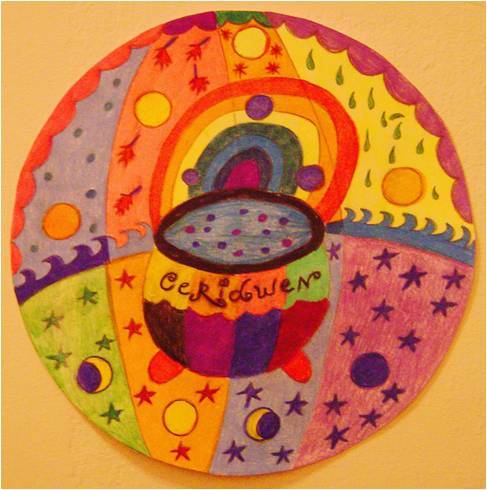 Cerridwen’s womb like her cauldron has potential to birth all manifestation and is the beginning and end of life. Neud amug ynghadeir o beir Cerridwen! Is not my chair protected by the cauldron of Cerridwen? In the sanctuary of the praise of the Goddess. Place Goddess candle in middle of altar and other green candles in each of the four directions. Anoint candles with oil and light them. Light incense and purify space. Conduct self blessing with salt water. Meditate visualizing the changes and transformations you would like to create in your life right now. After this is clear write down those specific changes and transformations in an area of your life you would like to make now and place on your altar. The circle is open but unbroken. Let candles burn out. Keep the piece of paper on your personal altar until the change and transformation has taken place.